Most of you had no problem spotting Anatoly Karpov in the turtle neck sweater. The game was played during the Soviet boycott of Korchnoi, and Karpov was 'rested' for the match with Switzerland to avoid a potentially embarrassing encounter. 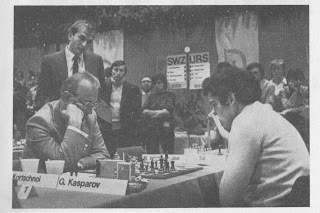 The player peering over Korchnoi's shoulder proved harder to identify. It is Alexander Beliavsky. At the time Beliavsky was regarded as a potential future World Champion but, despite winning the Soviet championship twice and the World Junior title, he has only qualified once for the Candidates matches, losing to Garry Kasparov in 1983. He is currently the second oldest player in the top 100 (Korchnoi is the oldest).